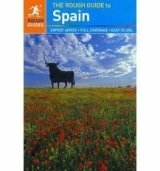 Full-colour throughout, The Rough Guide to Spain is the ultimate guide to this alluring country. With 30 years experience and our trademark 'tell it like it is' writing style, Rough Guides cover all the basics with practical, on-the-ground details, as well as unmissable alternatives to the usual must-see sights. At the top of your list and guaranteed to get you value for money, each guide also reviews the best accommodation and restaurants in all price brackets. We know there are times for saving, and times for splashing out. In The Rough Guide to Spain: - Over 50 colour-coded maps featuring every listing - Area-by-area chapter highlights - Top 5 boxes - 'Things not to miss' section Make the most of your trip with The Rough Guide to Spain.